Middlebury College students turned their backs to author Charles Murray during his lecture in March. 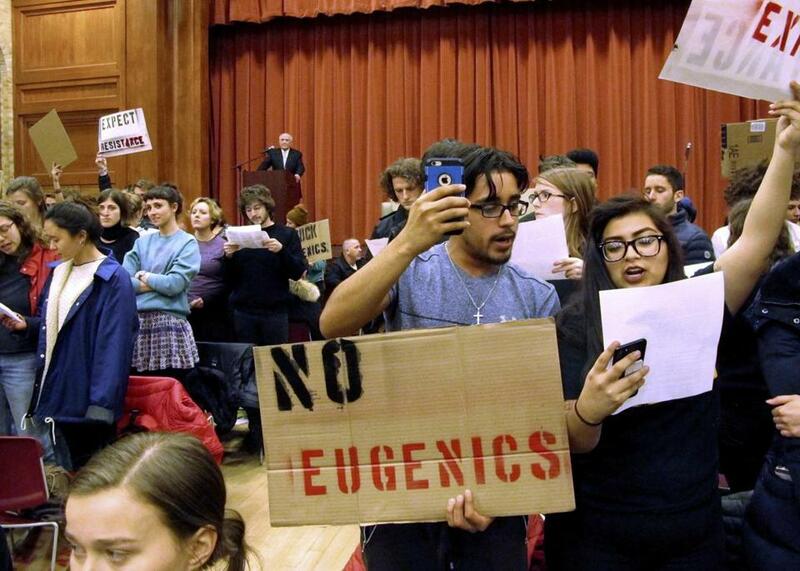 More than five dozen Middlebury College students were disciplined for their roles in shutting down a speech by author Charles Murray in March, the college announced this week. But the students were spared the most serious penalties in the episode, which left a faculty member injured and came to symbolize a lack of tolerance for conservative ideas on some campuses. None of the students were suspended or expelled. A college spokesman, Bill Burger, said the statement was intentionally vague because of concerns that releasing details would identify individual students, violating federal laws aimed at protecting student privacy. An estimated 100 to 150 students at the liberal arts college shouted down Murray, who had been invited by a conservative student group. A political scientist who has written several books, he is best known for “The Bell Curve,” published in 1994, in which he linked socioeconomic status with race and intelligence. Student protesters said the book espoused a racist view that had no place on a college campus. When Murray moved to another room to deliver his talk, protesters pulled fire alarms in the hallway. When he was done and left the building, several masked protesters, who may have come from off campus, began pushing and shoving Murray and his faculty interviewer, Allison Stanger, who suffered a concussion after someone grabbed her hair and twisted her neck. After the two got into a car, protesters rocked it back and forth and jumped on the hood. Afterward, Laurie L. Patton, the president of the college, issued a public apology to Murray, promising accountability. “Our concern is acts of disruption and violence, where available means of protest were declined,” Patton said. She added then that the episode involved clear violations of the college’s policy against disruptive protests, with penalties ranging up to suspension. Murray, a scholar at the American Enterprise Institute, criticized the penalties announced this week as meaningless. The college had appointed a law firm as an independent investigator. The firm conducted interviews and received thousands of photos and videos of the evening’s events. Explaining why only 67 students had been punished when more than 100 were believed to have been involved, Burger said it was because there were certain areas of the room where no photos were taken. “They were able to identify only those people who they were able to identify,” he said. Burger also rejected the suggestion that the sanctions were meaningless. “What I can tell you is that the students who received them don’t think they’re meaningless,” he said, adding that 20 students had requested hearings to dispute the allegations. Matthew Dickinson, a political science professor at Middlebury, said he believed that while the penalties might satisfy some members of the faculty and the community, others would say the college was in a difficult position of having to investigate and impose sanctions by the time some students graduated. More broadly, he said the episode reflected an institutional failure in the way students are taught at Middlebury. In a separate news release Tuesday, the Middlebury Police Department said it would not bring charges in connection with the protest. The department’s chief, Thomas Hanley, said in an interview that it was impossible to identify the protesters who hurt Stanger or damaged the car.